Arlington collects about 50,000 cubic yards of leaves every year, which are recycled into leaf mulch. Find out the schedule for fall leaf collection in your neighborhood. Christmas trees are collected the first two full weeks in January and recycled into wood mulch. Find out when Christmas trees will be collected or can be dropped off. 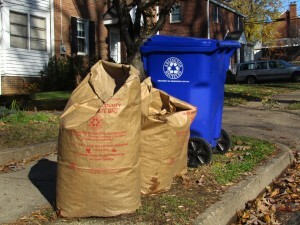 Your curbside collection services include year-round yard waste collection and a yard waste cart. Learn more about our Year-Round Yard Waste collection services. Leaving grass clippings on your lawn fertilizes the grass and reduces the amount of trash that must be collected and disposed of. Get grasscycling guidelines for your lawn. Unbundled brush (clippings and tree trimmings) is collected and recycled into wood mulch. Learn how to prepare for your brush pickup. Composting reduces the amount of organic kitchen, garden or yard waste being disposed of, and it helps create a rich soil amendment that you can use in your garden. Learn how to start making compost. Please have account number available.